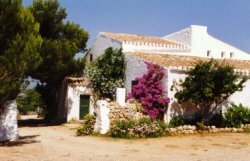 VILLAS AND APARTMENTS TO RENT IN ES MIGJORN, MENORCA, SPAIN. Welcome to our selection of holiday homes to rent in Es Migjorn, Spain. If you have been on a holiday and longed for some peace and quiet and to be away from the maddening crowd, Es Migjorn is just the place for you. It has a very relaxed atmosphere and the people too are in no particular hurry. In fact, a visit here is the perfect way to unwind while you leave all your cares behind. The very drive from the airport, about 40 minutes away, is indicative to what awaits you. You travel through beautiful countryside with hardly any outside influence, as it is away from the main tourist destinations. There is hardly any tourist accommodation here; the nearest is in Santo Tomas, about 7 km away. This is a typical Menorcan town, where nothing really happens, except for the visitor who just wants to unwind and relax. And for this, it�s an ideal place. This could well be the starting point for a long walk or even a hike with the many rural paths and track roads that start from here. The place is surrounded by beautiful grand countryside that is almost picture perfect. Further south from here will lead you to the most beautiful virgin beach in the whole of Menorca. Spend some time talking to the villagers and getting to know them. You will realise that nothing much affects them; they are in no hurry and have no deadlines. Very different from what most of us are constantly chasing. A trip to Binigaus will have you admiring the Binigaus Nou country house, besides the Cathedral Cave � so named because of the sheer height of the ceiling. In times past the cave was used as worship centre. Further on the road leads you to a beautiful beach � the Playa de Binigaus. Attend the weekly market that is held every Saturday from 9-1pm where fresh farm produce, fruits, handicrafts and ceramics are on sale. You can also pick up some high quality leather goods at discounted prices at the Jaime Mascaro factory outlet. Worth a trip just to appreciate the beautiful location that is reached only by a very picturesque and narrow gap in the hills. Ferreries is surrounded by spectacular countryside and valleys. You are sure to hear some very interesting stories, which are a mix of legend, history and religion while here. Looking for self catering holiday accommodation in Es Migjorn? Then below is a selection of holiday apartments in Es Migjorn and holiday villas in Es Migjorn that can be rented direct from their owners. You can either click on each listing for further details or you can use our search engine on the left if you are looking for something in particular.